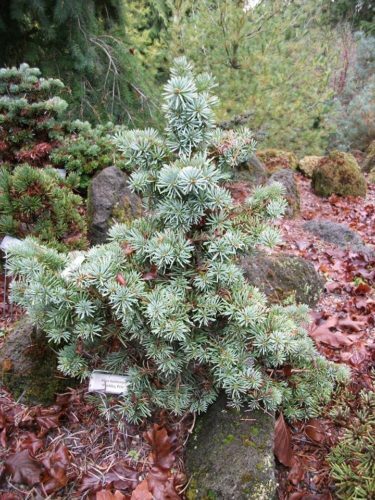 Abies lasiocarpa 'Prickly Pete' #6 is a dense, miniature selection of Subalpine fir with short, irregular branching and very attractive, long, sky Blue needles. Young plants will grow as irregular globes for many years, before (with luck) apical dominance develops eventually allowing plants to grow as anticipated. After 10 years of growth, a "mature specimen" will measure 12 inches (30 cm) tall and wide, an annual growth rate of 1.25 inches (3 cm). This cultivar originated as a very fastigiate witch's broom found in the 1980s by Colorado's Jerry Morris. He described his find as, "fastigiate, tight and vigorous, 20’ up the tree, 15 inches wide by 7 feet tall; 3/10ths of a mile north on Dufunny on the downhill side of road; if going north, along Blackhill Road. Jerry provisionally named this plant, Abies lasiocarpa [#6], identifying it as his 6th ever Subalpine fir selection. Nomenclature purists will spell it out fully as, Abies lasiocarpa 'Prickly Pete' #6. As previously stated, the anticipated growth habit of this plant is dense and narrowly fastigiate. As of 2018, very few plants have begun to approach this form, remaining globose, albeit attractively so. 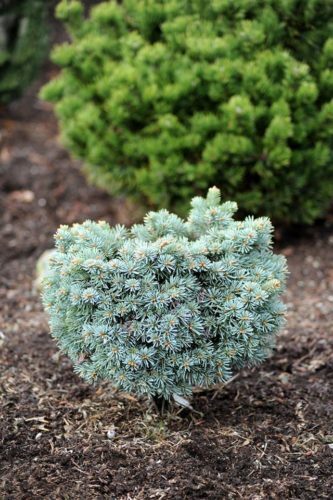 Abies lasiocarpa 'Prickly Pete' in a private garden in Washington state.